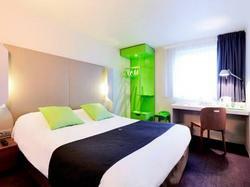 Situated in Arcueil on the N20, this Campanile hotel is located on the southern edge of Paris. It offers comfortable and affordable accommodation just a stone's throw from the Capital. Whether on a short or long stay in the area, Campanile Paris Sud - Porte d'Orléans - Arcueil provides you with a practical and functional living space for any occasion. Guestrooms are equipped with modern en suite facilities, satellite TV and free Wi-Fi internet access as a way to enhance the sense of relaxation and efficiency associated with Campanile hotels. Finally, before you venture out to spend a day walking the streets of Paris, sit down to a full breakfast buffet. Or, return to the hotel in the afternoon or evening to enjoy family-style cuisine in the hotel's restaurant. - At the first set of traffic lights, turn left. - Continue straight on until the N20. - Continue on until you see the hotel on the left. - Exit at Porte de Chatillon. - Continue in the direction of Porte d'Orléans, N20. - Take bus 28 to Porte d'Orléans, then take bus 187 to Croix d'Arcueil. Montparnasse (4 km). Orly Airport: 14 km (20 minutes). The buffet breakfast is served daily from 07:00 to 9:00. Since reservations cannot be guaranteed for late arrivals and no-shows, it is important to arrive at the reception before 23:00. If this is not possible, please contact the hotel prior to 23:00 to inform them of your estimated arrival time. This air conditioned room features an LCD TV, free Wi-Fi access and a courtesy tray offering tea and coffee. The en suite bathroom includes a separate shower and bath and a hairdryer.